April is National Car Care Month – What should I do? Spring is here…well in most places in the United States. While the lakes are still unthawing in Northern Minnesota and the students are returning from sunny Florida’s spring break climate, getting your vehicle ready for the summer travel season may be on your to-do list. Did you know that according to the non-profit Car Care Council that approximately 84% of vehicles on the road need parts or service? Some of the more common issues were low or dirty fluids, worn out wiper blades, dirty air filters, and tire inflation or tread issues. Check out the complete list at CarCare.org. Did you know that the average age of a vehicle on the road is 11.5 years? With over 250 million vehicles registered in the United States, does your vehicle need some type of maintenance? Review your owner’s manual. Determine when fluids need to be serviced. Become familiar with the fluid locations under your hood. If you are unsure of any fluid locations, don’t guess, as mixing up different types of fluids could be detrimental to vehicle components and could cause a dangerous driving situation. If you are more of a hands-off person, that’s OK, take it to a quality repair facility with ASE Certified Technicians. When adding fluids, more isn’t better. Do not overfill fluids and do not interchange fluid types. Back 20 years ago, it used to be accepted to change the oil every 3 months or 3,000 miles. Today many vehicles use a computer system to determine when the oil should be changed. The computer monitors engine revolutions, engine temperature, and miles driven to calculate the appropriate time for an oil change. Just picking an interval number isn’t that easy. It depends on the type of driving that you do and where you drive (e.g., dusty roads). One of your oil changes may be at 7,500 miles, while another at 5,000 miles. Follow your owner’s manual recommendations. And make sure the computer system is reset properly every time you do have your oil changed. Use the correct viscosity (SAE rating) and service type (API rating). When the oil is changed, grease the steering, suspension, and drivetrain systems that have grease zerks. Air filters clean dirt and dust that is drawn into the engine. Inspect the air filter at every other oil change. Manufacturers recommend replacement anywhere from 24,000 miles to 45,000 miles. But this again depends where you drive. Below is a common way to check/change the air filter as illustrated in my book, Auto Upkeep. Inspect tires for wear and check tire pressure. The correct tire pressure is located on the tire placard on the driver’s door jamb. Rotate tires every 7,500 miles or as recommended by the manufacturer. Follow the rotation placement by the manufacturer. And don’t reverse directional tires (these are tires intended to move in one direction). Directional tires can only be rotated front to back. Walk around your vehicle and inspect the all lights – headlights (low and high beam), turn signals, brake lights, and parking lights. Replace as necessary. Visually inspect your vehicle’s wiper blades for cracking, wear, pliability, and tears. Replace in pairs. The engine’s crankshaft transfers motion to engine components such as the water pump, alternator, air conditioning compressor, power steering pump, and mechanical fan. If this belt breaks, your vehicle is stuck on the side of the road. And with most newer serpentine belts, they may not show any visible damage but may be completely worn out. The rubber on belts wears away similar to a tire, losing rubber, but not necessarily cracking. Use a belt wear gauge or app to inspect your vehicle’s belt. Inspect hoses for cracks and leaks or if they are excessively stiff or real spongy. Coolant is as important in the summer as it is in the winter. A coolant’s boiling point and freezing should be determined. A 50% water to 50% antifreeze mixture is commonly recommended. This will yield a -34 degrees F freezing point and a boiling point of about 226 degrees F. Many extended life coolants last over 100,000 miles. Follow the change intervals in your owner’s manual. You can also use coolant test strips to test coolant effectiveness. To learn more about your cooling system, check out these videos at Video.AutoUpkeep.com. The cabin air filter cleans the air that you and your passengers breathe. The purpose of this is similar to the filter in your home’s HVAC system. Check your owner’s manual for the location and interval change requirements. These commonly last two years – but again this is dependent on where the vehicle is driven. Brake fluid should be replaced according to your owner’s manual. Unfortunately it is commonly neglected. Many manufacturers recommend replacing the fluid anywhere between 2 to 4 years. Brake fluid can be tested for contaminants. Considering how important your brakes are to safe operation, this maintenance item should not be overlooked. You can also use brake fluid test strips to test for fluid contamination. A battery can be as much of a problem in the summer as it is in the winter. Stop by a local parts store or service center and have your battery load tested. The load test simulates the load your starter and accessories put on your battery. It can provide an early warning sign to determine when to replace it. Many shops and parts stores will do this for free. For example, O’Reilly Auto Parts will test it. Batteries commonly last 5 years or so. In the “old” days, spark plugs were changed every year. Today’s plugs commonly last over 100,000 miles. Follow your owner’s manual recommendations. Vacuum out all that dirt that has accumulated over the winter. Use only properly formulated car wash soap to wash the vehicle and find a wax that is safe for your finish. 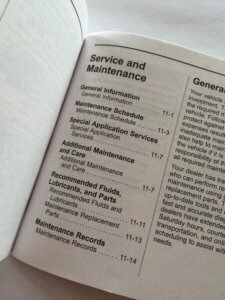 The ultimate guide to specifics about your vehicle is your owner’s manual. Crack it open and read it. 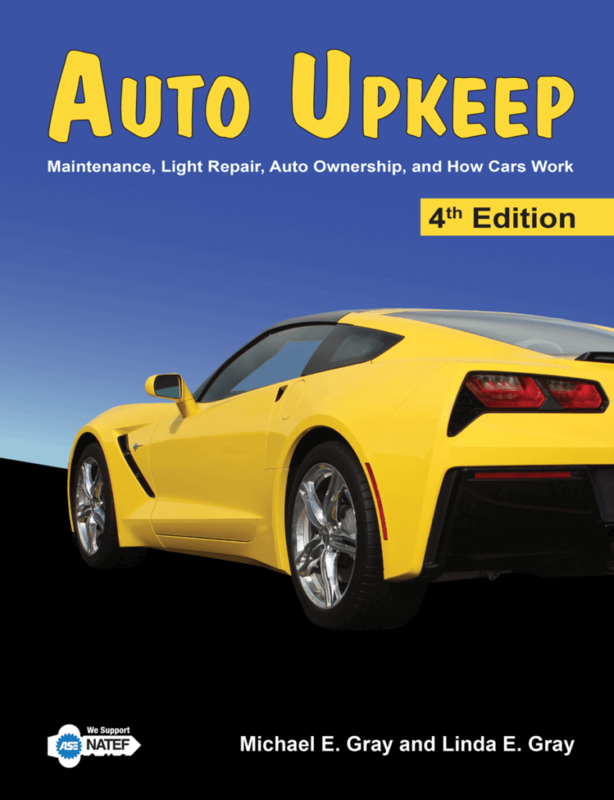 To learn more, check out my book Auto Upkeep. Auto Upkeep helps keep you safe and your vehicle reliable by providing easy-to-follow information with detailed pictures and drawings. Discover how to choose a quality repair facility, buy a car, handle roadside emergencies, diagnose common problems, and communicate effectively with technicians – all while saving money. Over 100,000 copies have been sold! Mike has roots in the automotive service industry. He began diagnosing and fixing cars at a young age in his family’s service station. He has worked in automotive parts supply stores, towing companies, and service facilities. After graduating from St. Cloud State University (MN) with a Bachelor’s degree, he implemented and taught a basic car care program at the high school level. During work on his Master’s degree at Illinois State University (IL), he was a curriculum specialist on a National Science Foundation project where he co-authored ten integrated mathematics, science, and technology books designed for team teaching. Mike has also supervised teachers in Career and Technology Education as a school system administrator. PrevPreviousTime to Change Your Spark Plugs?